At Cave Creek Recreation Area, Maricopa County maintains a variety of trails including the 3.3 mile Overton Loop. This trail wraps around a small mountain, providing views across the northern Valley of the Sun, as well as, some great Sonoran vegetation. From this trail, you can see the McDowell Mountains in the near distance defining the northern edge of the valley. 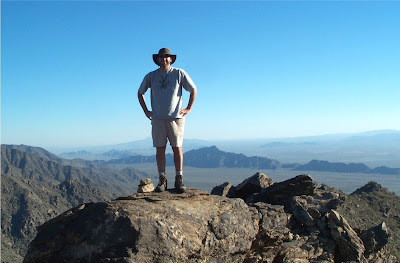 In addition, to the far east are the Superstition Mountains, Squaw Peak right in the middle of the valley, and the 4000 feet Sierra Estrella in the far distance which defines the southern extent of the valley. Lastly, I have to include a couple of additional shots of the spectacular sunsets we've been having. These were taken without a tripod, so I apologize for any blurriness.